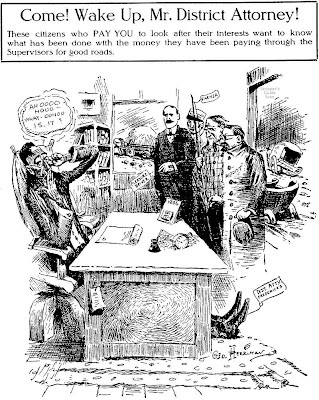 On February 28 and March 2 Herriman continues his series of editorial cartoons on a municipal graft scandal (including one of his first front page cartoons, the one from the 28th). Herriman apes Opper's style on the one from the 2nd. 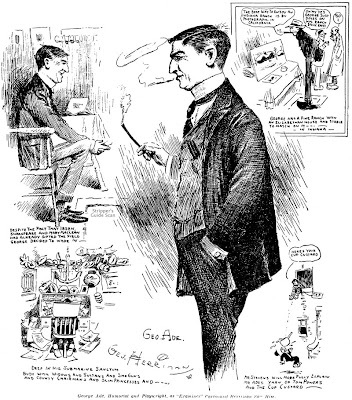 On Sunday the third of March Herriman contributes a caricature of George Ade. Ade, the popular author of Fables in Slang, is visiting California probably hawking his new book The Slim Princess. 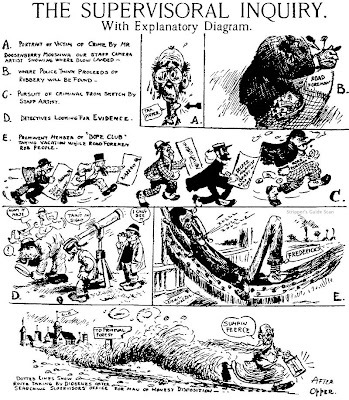 The final cartoon, printed in the Sunday Automobile section of the Examiner, is in its raw form. Sorry I didn't clean this one up but I'm on deadline for two comics related projects and I also want to finish the renovations on a room in our house this weekend -- only so many hours in a day. Heck, maybe you folks will tell me you like it better this way and I can dispense with the many hours of restoration I do on these images every week. Following through on the new versatility theme, Chicago Tribune - New York News Syndicate comes up with "Glen Forrest," a new Sunday color comic feature wrapping up adventure, a nature background, lots of villains and a romantic in­terest all in one neat third-page pack­age. First release date is Sept. 14. 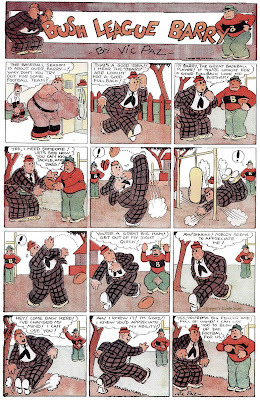 Accompanying the adventure comic is "Catesby," a Sunday strip by the same artist which may be used by itself or as a pendant to convert "Glen Forrest" to half-page size. "Catesby" is a gag strip with a nature angle, available in color or black-and-white. Creator of "Glen Forrest" and "Catesby" is William Ferguson, an old hand at newspaper features. He left his Kansas farm at the age of 18 to study at the Chicago Academy of Fine Arts, took cours­es under editorial cartoonist Carey Orr and under Carl Ed, who draws the "Harold Teen" strip. 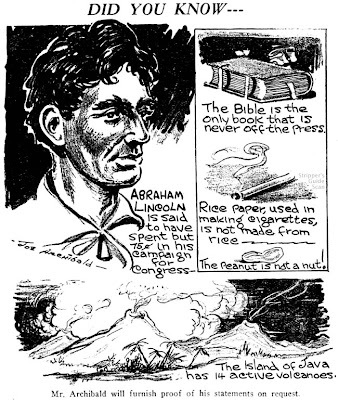 He joined the Chicago Tribune art staff in 1920, later left to do cartoons and comic strips for midwest farm dailies. In 1927 Mr. Ferguson went to NEA Service, for which he created "This Curious World," a strange-nature-facts feature. Since 1947 he has been a traveling lecturer for the National Audubon Society. Nature settings for "Glen Forrest" will be based on Mr. Ferguson's surroundings at his Colorado home near Rocky Mountain Na­tional Park. Here's a neat little feature that I rather liked, even to the point of cajoling a cartoonist of my acquaintance to revive a similar idea with yours truly at the writing helm. Said cartoonist wisely told me to go climb a tree. 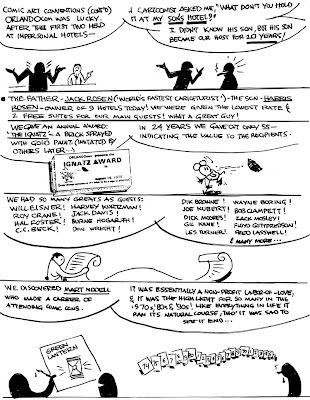 Your Newspaper featured quick little factoids and bits of history concerning the journalism biz. It was most often used at the bottom of the front pages of Sunday comic sections and on the covers of those comic book sections that enjoyed a brief popularity in the late 70s and early 80s. I imagine it was a pretty easy sell to newspaper editors, the same way editors have a soft spot for comic strips about reporters. Bill Kresse, who was a staple at the New York Daily News in the 70s, created Your Newspaper for the Journal Press Syndicate. Despite the impressive name I think this was just Kresse's self-syndication company name. If so he did an impressive sales job because the feature ran in a goodly number of papers, at least for awhile. The earliest start I can find for the feature is November 2 1980. Although you rarely see the feature in newspapers after the mid-80s or so, the Journal Press Syndicate still faithfully offers the feature in the annual E&P Syndicate Directory to this day. My assumption is that once Kresse had a big batch of these evergreen panels completed he's just continued to offer them ever since. What ever happened to Bill anyway? I liked his style. There's a bar in NYC that all the Daily News cartoonists used to hang out at and the walls are filled with their drawings and other cartoonists as well. Lotsa fun! As far as I know Bill Kresse is still hale and hearty -- and retired? Allan, you're right. Bill Kresse is doing well. He lives in Long Island with his lovely wife. I used to see Bill at least once a month at the Berndt Toast Gang meetings. We had lunch at the Overlook Lounge last year and he showed me some of his recent work. He's been doing some gag cartoons! The Overlook (225 E 44 Street, NYC) is the bar with not only one but two cartoon murals. Bill's work is on both the old one (from 1976) and the new one (2005). The Overlook used to be called Costello's and it was a big hangout for the Daily News staffers, which used to be just a couple blocks away. This is a wonderful blog and I really should visit it more often. Great work, Allan. The only thing better might be if Ger Apeldoorn started his own blog!!! Thanks for the update on Kresse. If you check out the links on the left you'll see that Ger has indeed started a blog. Yes, the Overlook, that's the one. I took a friend of mine there last year without telling him why I picked it, and when we got to the back he started laughing when he saw why. Thanks to Patrick Merrell for mentioning its existence. And I'm happy to hear about Bill again; I miss getting my weekly dose of his art. Here we are at our last post of The Funnies. We learned a bit about it in the process, though not the information I was hoping for. If anyone ever does come across any of this material appearing in a newspaper I'm still very interested, so don't keep it a secret! One more round of huzzahs for Cole Johnson who provided superb color photocopies of his issue of this rare series. Today we have another batch of dailies. Two of interest; Peaches seems obviously an Art Helfant outing though credited to "R.A.W." 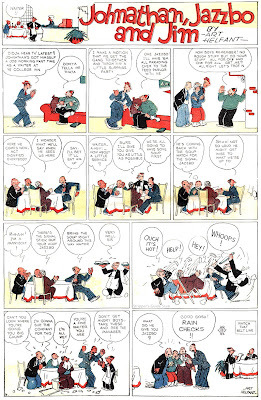 And Jacky, the only strip in the section by Sidney Garber, someone I've never heard of. Sidney Garber is best known for being an animator for Fleischer - with work appearing in 1930-1932. He was born c1909, and died very young circa 1931. "Del Tebeo al Manga, una historia de los cómics #3". It's in spanish, but it's good. Thanks for the Garber info! Thanks for the interesting detour. 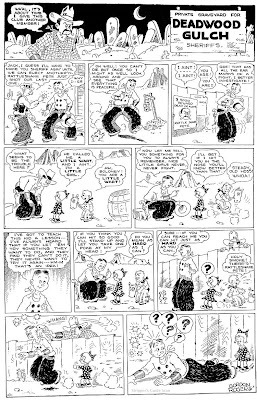 Cole Johnson's issue of The Funnies had a wide array of daily-style strips in addition to the Sunday-style strips. We'll cover the rest tomorrow, our last post on the subject. I've been loving all of these. Even the crummiest ones have more character than most strips today. 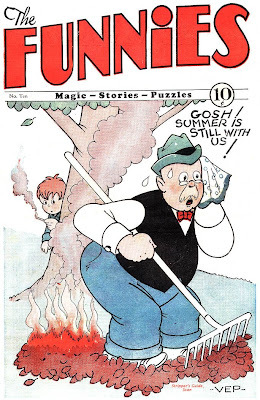 Winding down now on the second issue of The Funnies, here we get encores of Boody Rogers' Deadwood Gulch and VEP's Bush League Barry. What is the cover of this one? It WAS sad to see the end of OrlandoCon... although years later Jim did do some FUNcons which were nice.